Over half of young adults accrued debt from education, according to the Federal Reserve. GOBankingRates surveyed 500 Americans about college and student loan debt. Millennial respondents said they would pay off their student debt completely between 28 and 29. Student loans are an unfortunate reality for most Americans. More than 40% of those who attended college have accrued some kind of debt from education. With college education prices rising steadily, the problem isn’t going away anytime soon. GOBankingRates conducted a survey that asked 500 Americans various questions related to college education and student loan debt. These insights were then analyzed separately by age and gender of the participants. What Age Will You Pay Off Your Student Loans? Survey participants were asked what age they thought they would fully pay off their student loan debt. The answers differed significantly between gender and age groups. On average, males answered 26 years old, and females answered 33 years old. However, age insights revealed an interesting pattern. The millennial and Gen Z survey respondents said they would pay off their student debt completely between 28 and 29. Gen Xers, meanwhile, said it may take them until ages 37 to 45 years old to pay off debt. Perhaps the younger respondents are too optimistic about the timeframe. Baby boomers revealed they paid off their debt early on, with 55- to 64-year-olds saying by age 24, and ages 65 and older saying they paid off student debt as early as 18. While respondents may believe they will pay off their student loan debt fairly quickly after college, a GOBankingRates study predicts a different outcome. How Long Does It Take to Pay Back Student Loans? In a separate study, GOBankingRates determined which college majors take the longest to pay back. This study looked at several factors, including the average cost of the degree and the median income a person earns with each degree. Below are the degrees that take the longest to pay back. The difference between the survey responses and the reality of time needed to pay off debt is surprising. Of the 500 survey participants, 127 people majored in business. The second-most popular major within the survey was education, with 42 participants. Within the study, education was in the top five of college majors that would take the longest, taking 37 years to pay off. The median income for this degree is $46,000, with the average cost of the degree at $171,000. Education degrees are extremely popular, with over 125,000 awarded every year. Business was No. 33 on the list of most expensive majors, with an average cost of $138,108. A business major’s median income was much higher than educators’ at $62,000, and it only takes 22 years to pay off. What Is the Average Student Loan Debt in America? The Quarterly Report on Household Debt and Credit revealed that student loan balances accounted for $15 billion out of the non-housing balance total of $58 billion. The typical amount of education debt in 2017 among those with an outstanding balance was between $20,000 and $25,000. 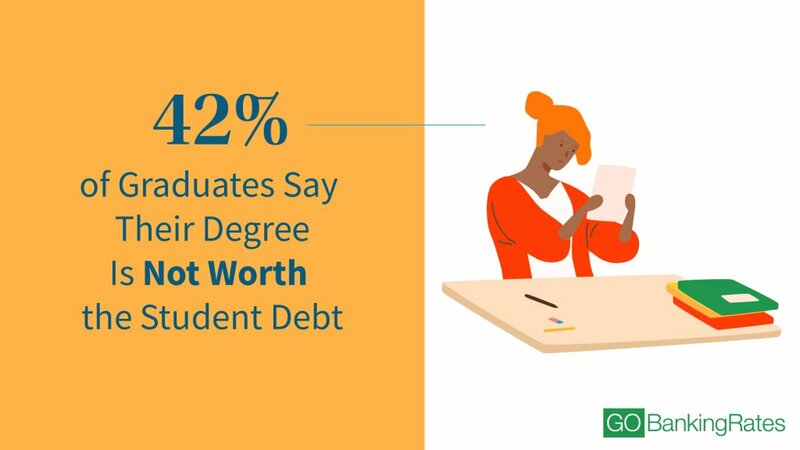 However, about 30% of individuals have deferred their student loans, which does not require them to currently contribute to their repayment plan. For those presently making payments, the average monthly payment is between $200 and $300 a month. Women are also taking longer to pay off their student loan debt. The American Association of University Women released a report around women’s student debt crisis. As of fall 2016, women represented 56% of those enrolled in American colleges and universities, and the report indicated that women take on far more student loan debt than men. Because of the consistent gender pay gap issue in America, women also have less disposable income to repay that debt. Keep reading to see the average student loan debt in your state. Methodology: GOBankingRates conducted a survey using Survata and asked 500 Americans from across the country the following questions: (1) What is the highest level of education you have attained? (2) Do you have any minor or major regrets about your undergraduate experience? (3) On a scale of 1 to 5, how much do you regret your ultimate decision to go to college? (1 = no regrets, 5 = greatly regret); (4 and 5) Do any of the following regrets apply to you? Select all that apply. (6) If you could go back in time, would you make any of the following decisions? Select all that apply. (7) How much student loan debt did you accumulate throughout your undergraduate college career? (8) Do you think you would have been able to get your current job without your bachelor’s degree? (9) Do you think your student debt has prevented you from doing any of the following? Select all that apply. (10) Do you believe your college degree is worth the amount of debt you accrued? (11) Would you ever consider furthering your college education? (e.g. getting a master’s or Ph.D.) (12) On a scale of 1-5, how valuable do you feel your college degree is for your career goals? (1= very not valuable, 5 = very valuable) (13) If or when you have children, do you want them to receive their bachelor’s degree? (14) What was your major or field of study in college? (15) What type of college did you attend? (16) By what age do you think you will fully pay off your student loan debt? The survey ran between March 25 and April 8, 2019. For the data set that includes majors, GOBankingRates found the majors that take the longest to pay back by analyzing the 50 most popular majors in the U.S. 2017-2018. GOBankingRates found the popularity rank of each major, how many degrees are awarded for that major per year and the average cost of a degree for that major sourced from Niche.com and CollegeCalc. Once the degrees were found, GOBankingRates found the average median income a person with that given major earns, sourced from Georgetown.edu. Lastly, citing Credible’s September 2018 on student loans, we assumed that a person will put 10% of their annual income towards student debt repayment in order to find how long it would take to pay back each given college degree. These companies are breaking down barriers left and right.